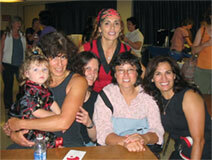 Marla BB was Co-Chair of the Special Training Planning Committee 2006 responsible for choosing trainers and their classes among top female martial artists from around the country and overseas for NWMAF's 30th Anniversary Special Training Camp 2006 outside Chicago, IL. Pictured left to right: Marla BB & Ruby, Sunny Graff, Linda Pulido, Arlene Limas, Graciela Casillas. Composer of "How Awesome" from "Destiny Meets Devil at the Crossroads"